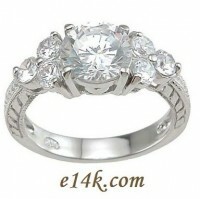 & 6 - 0.10ct Round Brilliant Cubic Zirconia stones. These Russian CZs are more precisely cut & polished from the finest quality CZ stone available. We use only precious metals and top-quality CZ Stones is all our CZ Jewelry.